Found a pamphlet from the 1948 Chicago Railroad Fair at the Housatonic Model Railroad Club / Fairfield Historical Society train show this morning. As American railroading has grown so has the nation. 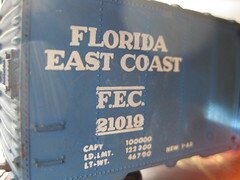 Steel rails have been the veritable backbone of our country in its development from a loosely-knit federation of infant states on the eastern seaboard to a thoroughly united empire. The B & O’s initial efforts shortly after the War of 1812 making American railroading a practical reality for the first time…the history-making debuts shortly later of such famed early trains as the old DeWitt Clinton in upper New York…the Pioneer puffing its way out of Chicago on its maiden trip only a century ago to open up the plains of the West…and the great streamlined mammoths of recent years have all played their part in American destiny. In Chicago this summer, the Chicago Railroad Fair graphically retraces this parallel history of railroading and the nation to give America its first great outdoor exposition since the war.